1. Transfer about a third of the black beans to a large bowl and lightly mash with a fork. Add the quinoa, carrot, potatoes, corn, leek, garlic, cumin, paprika, cayenne, sea salt, and black pepper, and mix well. The bean mixture should be somewhat sticky. Divide the bean mixture into 8 pieces, roll into balls, and flatten to make patties. 2. Heat the olive oil in a non-stick frying pan. Fry the patties, flipping occasionally, until cooked through with a nice brown colouring on both sides, about 3 to 4 minutes on each side. 3. 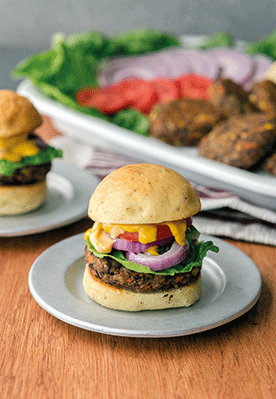 Serve patties on burger buns topped with tomato, onion, romaine lettuce, ketchup, mustard, mayonnaise, and pickles. Top with sliced avocado for some healthy fats, or give your burger an extra kick with some pickled jalapeno peppers! These burgers are full of complete protein, B vitamins, vitamin A, and dietary fibre – all of which are essential for muscle growth and nutrient absorption.